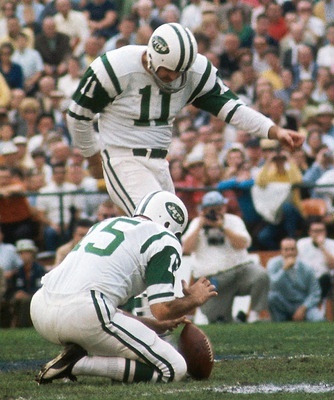 The New York Jets signed free agent placekicker Jim Turner. In 7 years with the Jets, Turner made 153 field goals, twice leading the league in field goals made. Turner played his college ball at Utah State where he was much more versatile than a typical kicker, also playing quarterback, defensive back and he was the punter. He got into 1 game as QB for the Jets, relieving Joe Namath in a 29-7 win against the Dolphins, going 2 for 4 for 25 yards. Met him at the grocery store here in Denver in 2008. He was going back for the anniversary. Came up to me because it was Sunday and I had a jets jersey on. He introduced himself and said it was good to see a Jets fan. He said he doesn't say it much because he is in the Denver ring of fame, but he really loved that Jets team. He did not like Mangini or mange,net at the time. He was a cool dude.